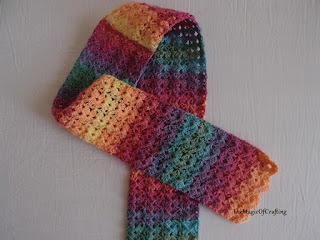 This gorgeous toddler scarf is made of basic stitches only but is fast to make and will attract everyone's attention. 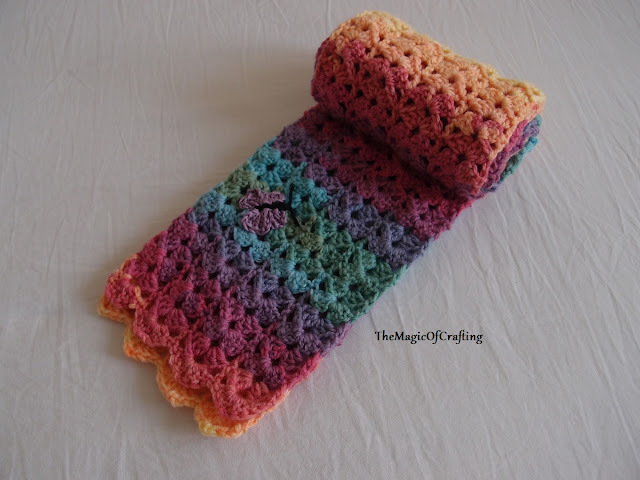 It can be made in any variation of colors or single color and any size (smaller or bigger), just check the notes in the pattern. Yarn: Sport/DK or Worsted Weight Yarn - the yarn weight does not matter as long as you adapt the scarf width to the desired. 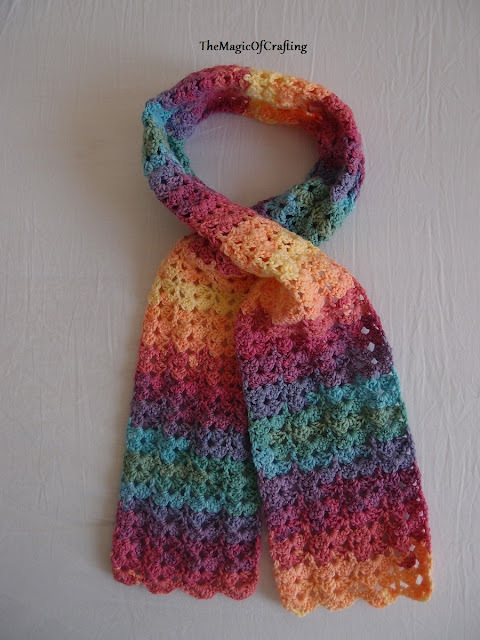 I used acrylic yarn, the whole scarf took around 80 grams/2.82oz. Notes: This pattern is made from the center first to one side, then to the next side. 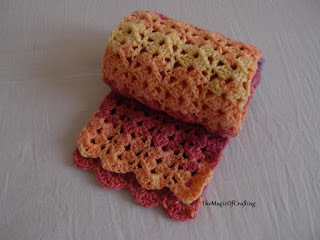 If you want to make it in different colours you may switch the color every few rows. Each row starts with a chain of 3 which counts as dc. Row 1: Sc in the back loop of the second ch from hook, sc in the back loop of each chain till the end (25 st). It is important to crochet in the 3rd /back loop of the starting chain. Row 2: Ch 3, * skip 2 st, in the next st work shell stitch(3 dc, ch 2, 3 dc - all in the same st), skip 2 st, 1dc in 3rd st*, repeat * - * till the end of the row, finish with dc in last st. Turn. Row 3: Ch 3, * work shell st in the ch2 of the shell st of the previous row, then 1 dc in the dc st between the shells of the previous row st *, repeat * - * till the end of the row, finish with dc in the dc of the previous row. Turn. Row 4 - 48: Repeat row 3. Now work the other side of the scarf the same way. 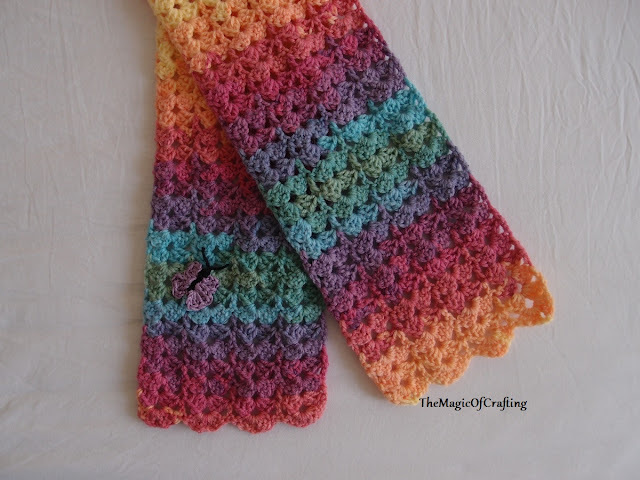 Join yarn in the starting chain, then make once row 2 and repeat row 3 till the scarf reaches the same size (48 rows). You can make it wider by adding another multiple of 6 to the starting chain. 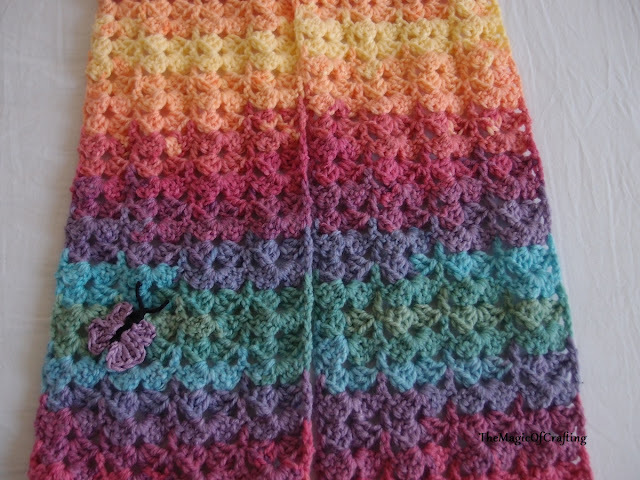 I have added a small butterfly at the bottom of the scarf by request of my daugther. Butterfly body - with black ch 5, then sc in second st from hook and in each ch (4 st). Join different colour - ch 3, in same st work tr, double, tr, then ch 3 and sc in the next st, now ch 2, dc, hdc, dc, ch 2 in next st.
Make the same on the opposite side. Hello! Love the scarf. Can you tell me what brand and color you used for the sample? It's gorgeous. Thanks! Since I'm living in Europe I'm using mainly European or Turkish yarn. This one particular is Turkish - ice yarn magic light, 100% acrillyc, the color is yellow, purple, orange, green, blue.